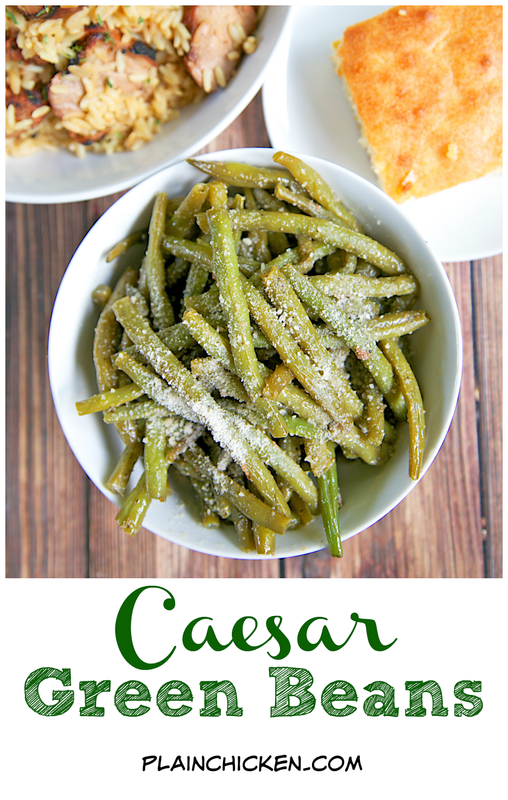 Caesar Green Beans Recipe - quick and easy side dish - only 3 ingredients! Cook green beans and then sauté in Caesar dressing. Ready in minutes. SOOOO good!! Double the recipe. These don't last long in our house! Chicken Legs loves green beans, so I am always coming up with new ways to prepare them. I was searching around for a quick side dish the other night and came across these green beans. They are ready in about 10 minutes and only have 3 ingredients. That is a win win in my book! 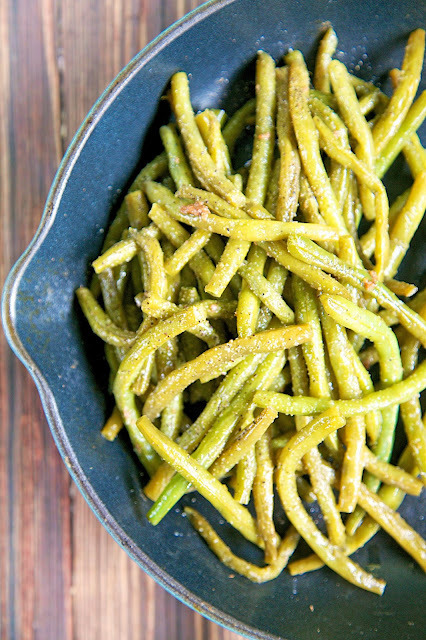 The green beans are cooked and then sautéed in Caesar dressing. I used Ken's Steakhouse Caesar Dressing. It isn't the creamy type. It looks similar to Italian Dressing. 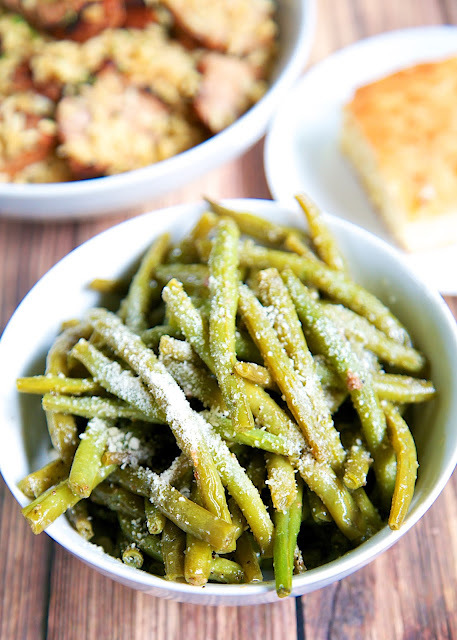 I topped the finished green beans with a little bit of grated Parmesan (from the green can). They were SOOO good. Chicken Legs didn't want to share. Next time I will double the recipe for leftovers. Trim ends of green beans. Bring a large pot of water to a boil. Cook green beans for 6 minutes. Drain and place beans in a large skillet. Pour dressing over beans and heat over medium heat for 5-10 minutes. Top with grated parmesan cheese. That does sound good and so quick and easy. I loved this idea. I tweaked it a bit and made it as brussels spouts! Such a great flavor for a side dish! Just like you, I'm always looking for new ways to make green beans. My husband will not eat many kinds of vegetables but loves green beans, so they always seem to make my menu. This is a very delicious side dish, and quick and easy. I only used one pan though. Instead of heating them in a skillet with the dressing, I put the beans back into the pot I boiled them in. I doubled this recipe and was glad I did. It was so flavorful! I served it along side my husband's grilled ribeyes and some garlic mashed potatoes. hi, is this dressing in a packet? What is the nutritional facts on this fish?